The Vancouver Asian Heritage Month Society (VAHMS) is now accepting submissions for explorASIAN in May 2017.
explorASIAN is a festival celebrating national Asian Heritage Month each May by building bridges between mainstream and Asian Canadian communities in the promotion of multiculturalism and diversity. This year, explorASIAN will place a special focus on the legacy, culture and accomplishments of the growing community of Canadians with mixed Asian heritage for the 150th anniversary of Confederation. 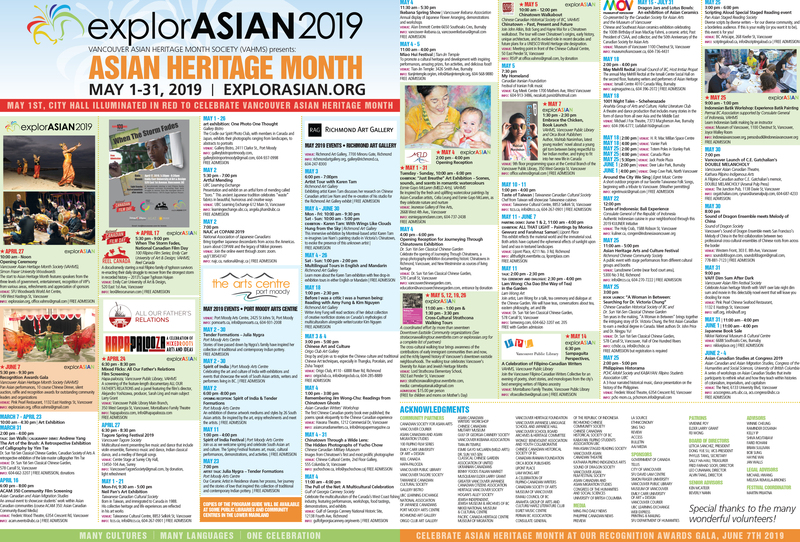 As a non-profit society, we provide a free service to support our cherished partners by promoting Asian Canadian events through our explorASIAN channels. If you would like to join us, please complete the submission form in this link and send a JPG image and copy of your logo to office.vahms@gmail.com by March 1st, 2017 for inclusion in the Vancouver Courier, explorASIAN program guide, and on our website and social media platforms. Thank you for your interest in collaboration with VAHMS! Did you know that VAHMS can promote your events throughout the year? We accept submissions throughout the year to promote events that support the mandate of VAHMS. If your organization is interested in having VAHMS promote an event through our website and social media anytime during the year, please complete this form and submit a poster (JPG file) to our VAHMS Coordinator at office.vahms@gmail.com 10 days before the event. Together, we can bring strength, harmony, education and understanding.